From the perspective of the overall logic of signaling mechanisms, overlapping binding specificity means that a particular input is likely to have many different outputs. This is particularly clear for adaptor proteins, which function solely to mediate protein interactions . In the case of SH2/SH3 adaptors, for example, the SH2 domain can recruit it to many different tyrosine-phosphorylated sites in a cell, and the SH3 domains can bring many different effectors along for the ride. This property allows the signaling process to be very sensitive to the potential binding partners available in the cell, their local concentrations, and their state of posttranslational modification—ideal for a system that must integrate many inputs and generate outputs that are precisely controlled in time and space. Such an ability also allows flexibility, in that a limited number of component parts can respond to and generate a diverse array of signals depending on need and context. This is conceptually similar to the ability of an enzyme (e.g., a kinase) to modify many different substrates, thereby radiating an activating signal to many disparate effectors. It is also important to consider the kinetics of protein interactions mediated by modular domains. Where they have been measured, most of the dissociation constants for such interactions are in the range of 10-8 to 10-5 M, strong enough to be biologically meaningful but hardly so tight as to be functionally irreversible. Assuming reasonably rapid association rates, these modest Kd values imply that the halftimes of the interactions are on the order of seconds. Thus, even "constitutive" complexes mediated by these interactions are not at all like the stably associated subunits of a holoenzyme, but are more a dynamic ensemble of interactions that are constantly breaking apart, resorting, and swapping partners. The components of a complex may change rapidly to adjust to an altered landscape of potential partners due to changes in subcellular localization or as other partners are recruited to the vicinity. Despite this overall plasticity, modular binding interactions also have the potential to mediate relatively stable complexes. Many signaling proteins contain multiple modular binding domains and/or binding sites, allowing the formation of multidentate contacts between binding partners. Protein complexes that are held together by multiple interactions are much less likely to dissociate, even if the individual interactions are quite weak. Figure 1 Regulation of protein activity by cis-trans binding equilibria. A hypothetical protein (loosely modeled on the Src family of tyrosine kinases) is depicted, consisting of a catalytic domain and two modular protein binding domains. In the absence of high concentrations of binding partners, the protein binding domains interact in cis with other regions of the enzyme, inhibiting its catalytic activity and masking binding sites for other proteins (bottom). Occasionally these intramolecular interactions will dissociate, transiently making the binding sites available for interaction with other proteins in trans (middle). 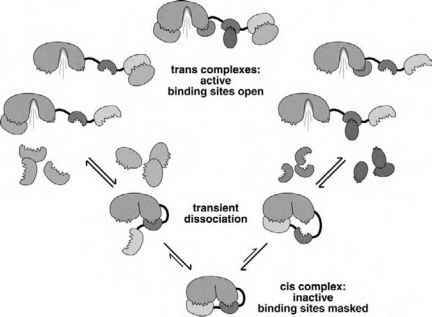 If high enough concentrations of binding partners are present, binding in trans will be favored and the cis complex will be disrupted (top). The catalytic domain is now active and multiple binding sites are available to interact with other partners (substrates, scaffold proteins, etc.). Thus, the activity of such a protein will be very sensitive to the local concentration of potential binding partners. interactions involving its SH2 and SH3 domains . Disruption of these interactions with high-affinity ligands leads to a more open conformation, unleashing the catalytic activity and freeing the SH2 and SH3 domains to bind to other ligands, such as substrates or proteins that can anchor the kinase to a particular subcellular location. This regulatory scheme permits activation of the kinase at very precise sites in the cell or by high local concentrations of a particular substrate which can disrupt the intramolecular interactions and then bind tightly to the activated kinase. 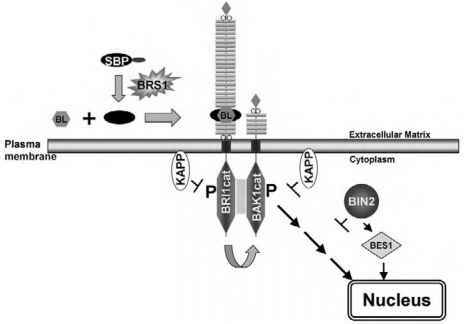 A host of other examples could be cited, such as activation of the neu-trophil cytosolic oxidase , assembly of membrane signaling complexes by MAGUK proteins , and regulation of guanine nucleotide exchange factors for small GTPases. Therefore it is important to bear in mind that identification of binding partners may reveal only one part of the role played by modular binding domains in a protein.